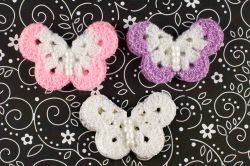 Stunning and delicate 3-D crochet butterfly. The sure grip alligator clip measures 1 3/4 across. This clip is perfect for hair that is over 2 in length or for little one's that need to pull their hair back out of their face. The clip is fully lined with ribbon and include Ladybugs and Lullabies special, Stay Put Strip inside to prevent slippage in even baby fine hair. This clip will work well on your daughter for years to come.